This article was written by Sustainable Finance Advisory associate Swe Thant and Managing Director Carey Bohjanen for CSR Files, a ThistlePraxis Consulting publication. Read the full edition here. Carey and team served as the Independent Advisor to the Nigerian banks during the yearlong process of developing the NSBPs and Guidelines and provide sustainability and risk management advisory and consulting solutions to a wide range of financial sector clients around the globe as well as in Nigeria, including recently serving as an advisor to the Central Bank of Nigeria. 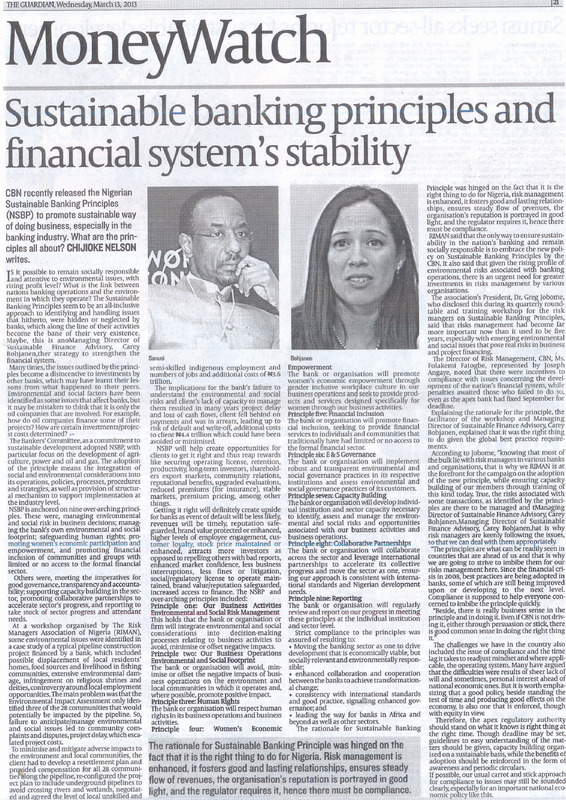 The Nigeria Guardian featured an article delving into the Nigerian Sustainable Banking Principles, an initiative led by Sustainable Finance Advisory. Sustainable Conversations published the full article – read it here. Finance and Human Rights – Strange Bedfellows?